It’s true. 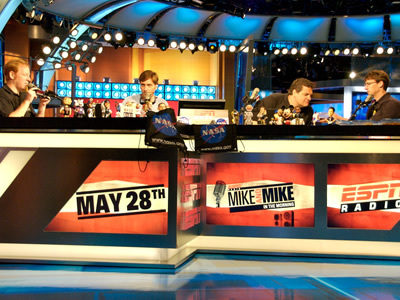 Both Chris and I were on the Mike and Mike show for our 15 minutes of fame. Ron better sharpen up his ego management skills. He is going to need it. We had an absolute blast. First, everyone at ESPN was awesome. 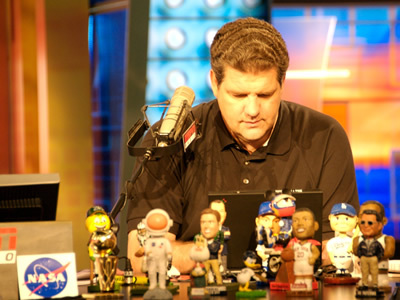 Golic is every bit the giant that he is rumored to be, and “Greeny” is obviously the brains of the outfit. From top to bottom both, along with their entire team, were extremely nice and courteous. Golic even continued to talk to us as he plowed through NASA’s space version of fiesta chicken when the segment went off the air. 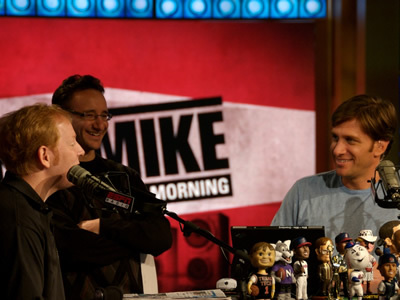 Greeny simply asked more and more questions about NASA. It was awesome. And I have to admit that I was totally star struck. These guys are our heroes. Second, they are very excited about their upcoming interview with Astronaut Ken Ham during STS-124. Before the show went live, you could sense their genuine giddiness about it. It was really cool to see their excitement about NASA and NASA’s future, which we try to promote everyday. 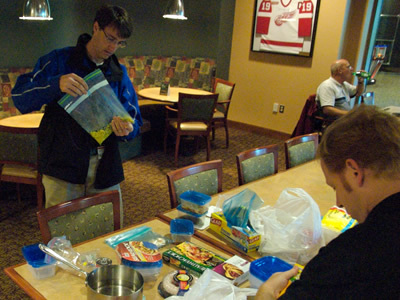 I also want to thank Michele Perchonok and all of the folks at JSC that provided the space food. Golic admittedly doesn’t like tomatoes or fruity deserts, but he still gave them high marks. Of course, we could find no evidence of the shrimp cocktail or the fiesta chicken by the end of the interview. Clearly those more than passed the Golic test. 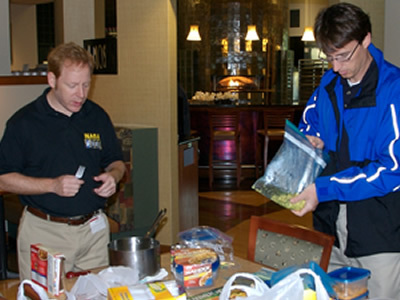 It was quite impressive considering that we didn’t even cook the space food in zero gravity*. 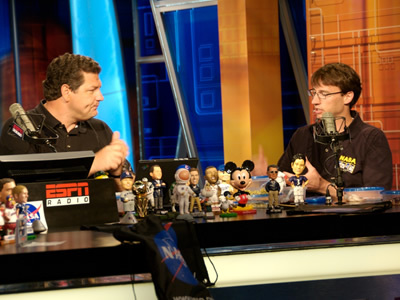 I also want to thank Mike “ESPN NASA Guy” Soltys and Scott Shapiro from ESPN. Rocky Lind from NASA HQ can back me up on this. These guys worked extremely hard to make this happen. They are both fans of NASA and went the extra mile at every step to work out our appearance on Mike and Mike and also the upcoming interview with Ken Ham on June 13th. Awesome. Now, here are a few pics from our crazy morning. *I recognize that the official term may not be “zero gravity.” Please accept this term in the spirit that it was intended… to be a punch line directed at our amateur preparation of the food. You guys did great can’t wait to see you fly the sr-71 in the flight suit. very cool, what could be better than nasa and espn!